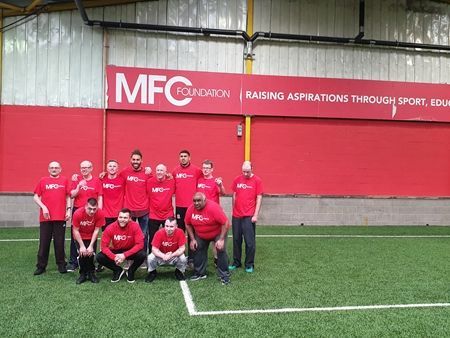 Last month there was a week of action at MFC Foundation, designed to raise awareness of all their work across the community. 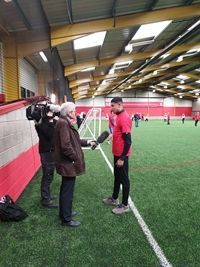 The media were invited to different sessions in which the Boro players also tok an active part.You might buy a lotto ticket on the way to the match but what happens to your money? I chatted with Head of the Foundation Helena Bowman to find out. It says on Helena Bowman's twitter that she is Head of MFC Foundation. Raising Aspirations and Changing Lives on Teesside. Under Helena's watch the Boro charity casts its net widely and sets its sights high. I joined Helena watching Ashley Fletcher, Jonny Howson and Ryan Shotton playing football with disability groups in the Herlingshaw Centre, Eston. Fly: Tell us about the MFC Foundation Week of Action. Helena Bowman: The week of action is all about promoting the Foundations work in the community. I think people know there is a club charity and probably understand a bit about what we do but this week is here to promote everything we do to try an get the message across about the activities and what we do in the community. Fly: I am surprised at the range of things you do. HB: Yes, so we have five activities today with the players of which all are different. We have four themes which we work under and we are trying to get that across this week for our week of action. Fly: So, this is what happens when you buy a matchday lottery ticket. HB: Yes, it goes to the Foundation and these are the activities that the money goes to. Fly: Here at the Herlingshaw Centre, Eston, we are watching disability groups playing football. HB: Yes, we have got a group of 3 adult day services with adults with disabilities attending today and they take part in weekly sessions with the Foundation all funded through the Premier League and BT’s Disability fund. We have been running this for 3years now and are hoping to continue you into next year as well. Fly: What other programmes are being highlighted together with player and media visits. HB: We have got a programme called Club Together, which is all about refugees and asylum seekers, people who have come to Middlesbrough and they know football unites, so we get them into football sessions and we help unite them with the community. We have got a session in a primary school in Redcar , which is all about physical activity and getting youngsters into sport. We have got an educational session at the stadium in partnership with Teesside Park which is about business and enterprise. The fifth session is a secondary school in Stockton, North Shore, a programme funded by Virgin Money Foundation, all about young people giving back to their community, identifying problems in the community and then solving them with their own ideas.